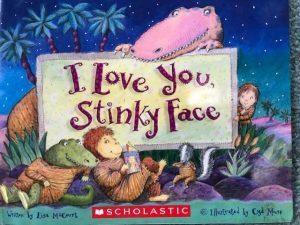 I Love You, Stinkyface: New Year’s Tips for Making Reading Fun for Your Child! My 6-foot tall 21-year old Mark snuggled up next to me. He had generously allowed me to read aloud to him one of his favorite childhood books, I Love You, Stinky Face. Yesterday I took Mark to the airport to go back to Washington, D.C. for spring semester of his junior year at George Washington University where he is a Political Journalism major (pre-law school). 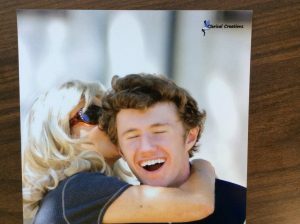 I can’t begin to share how precious it was to read the Stinky Face book aloud to him! Neither of us could stop smiling as warm, wonderful memories of his childhood washed over us. It was a moment that I will cherish forever. As I shared in a previous post, Mark had severe dyslexia as a child and hated reading for a long time. But he let me read aloud to him, and I did so through regularly from the day he was born throughout his mid-elementary years. Because he hated reading so much, I chose colorful, interesting books and read them aloud with funny, dramatic voices. I always held him close. So though reading independently was so torturous for him, I made reading times with Mommy filled with warm emotions, laughter, and lots of hugs. In 2018, my young man independently read 18 non-obligatory books (mostly philosophy and complex political science and history books). 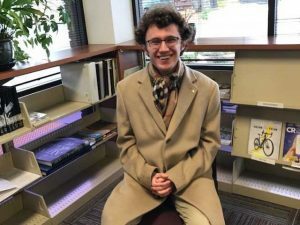 He is starting this spring as an intern at Brookings Institute, an internationally famous think tank, where he will conduct research on global political ethics. We feel so thankful and blessed that he was chosen for this position. 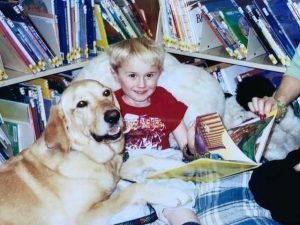 A highly successful thing I did with him was take him to our local library to read with Delilah the therapy dog. Going through Mark’s childhood albums before he leaves for school, we laughed over pictures of him and Delilah snuggled up in the corner of the library with a book. It’s fun to see Mark today sitting in the same corner of the library that he sat in when he was five! In this new year, many parents are resolving to read more with their children. Way to go! Whether or not your child is typically-developing or has special needs, make it a priority to read aloud with him every day. Snuggle close. Use funny voices that will make him laugh. If he struggles to read, don’t force him to read out loud. Trust me, he gets enough of that at school. Make reading times warm, positive, and loving. Keep going, and don’t get discouraged, no matter how old he is. Nice snacks during reading time don’t hurt! Make reading aloud together a time filled with positive emotions. For more insights on how to read successfully with your child, please see my youtube video, Reading to Your Child with CARE.